All Baedekers on Great Britain and London. There were no editions in French on Great Britain, only on London. Another interesting difference is that the German editions on Great Britain also include Ireland, whereas the English editions do not. 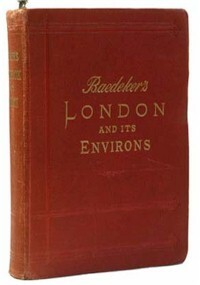 At last from 1880 onwards, the London editions included an appendix with street maps and a separate index. There are quite a few facsimile editions of these books - caveat emptor.